“SEEk” is an insightful look into the world of new media platforms and its on-going search for narratives that are exploring its true potential. It consists of public screenings, seminars, masterclasses and workshop experiences in VR and AR - tailored for filmmakers, creatives and the culturally curious attending TIFF 2018. For filmmakers - the accelerated change of media technology presents an open world of vast potential and excitement but hampered by technical jargon and inaccessibility. Critical to their understanding of how to create stories in this new framework is the focus on the user experience - and how audiences in the future would “see” their film. How would the cinematic experience evolve to accommodate these new forms? The side event will also consists of masterclasses and panel discussions - from focus on narrative development and storytelling to a basic introduction to AR, to full on workshops on animation and music production in VR. All in all, SEEk aims to be a place where a deep dive into new technologies can take place, offering curious new experiences for film festival attendees in Tromsø. “SEEk” will take place at Tvibit and Kulturhuset Verkstedet with special screenings also slated with TIFF 2018 programming schedule. SEEk 2018 was presented as a side-event produced by Filmveksthuset Tvibit and NUFF for Tromsø International Film Festival 2018. It focused on new media developments and presented the use of VR/AR technology in media production through seminar discussions, workshops and screenings. The project was primarily funded through the support of Nord Norsk Filmsenter. Tromsø Kommune, Tvibit, NUFF and TIFF contributed with project management, facilitation and equipment use and setup. An official information and workshop registration page, was created at the URL www.nuff.mo/seek along with an official social media page on Facebook. 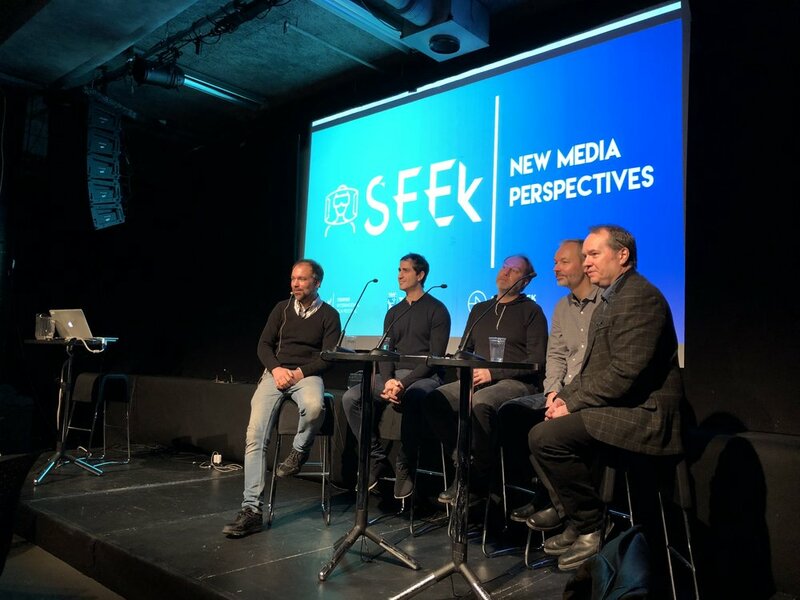 SEEk Seminars brought together a total of 3 guest speakers and 1 moderator – Kåre Vedding Poulson, Executive Producer and Cross Media Manager from DR, Christian Fonnesbech, Strategic Consultant for Nordic Film Games, Ali Zareiee from VR Oslo Business Cluster and guest moderator/host, Kristian Mosvold, producer from Øya Film. During the lead up to the seminar, Fredrik Graver, Head of Studies at Den Norske Filmskolen, was also added to the speaker´s line-up while he was visiting Tromsø and presented tertiary opportunities at the seminar as well as at Tvibit. The seminars focused on defining and exploring the ideas and opportunities in new media. Augmented Reality applications and technology was a popular focus and the majority of festival attendees have had little hands on experience with VR headsets and saw SEEk as a opportunity to try it out. with TIFF production staff and there is an estimate of about 50 attendees in total who had attended the seminar and included industry professionals, policy makers, students and the technologically curious with good engagement with the theme in the QA sessions that followed the panel debates. SEEk workshops took place at Tvibit and the use of the VR software were demonstrated by developers and expert instructors who brought equipment with them. The workshops were by registration only and was included in the print catalog and web portal for TIFF 2018, social media pages and which centered around the official sub-page www.nuff.no/seek. The workshop with the biggest attendance was the AR Bootcamp, with a total of 30 participants. 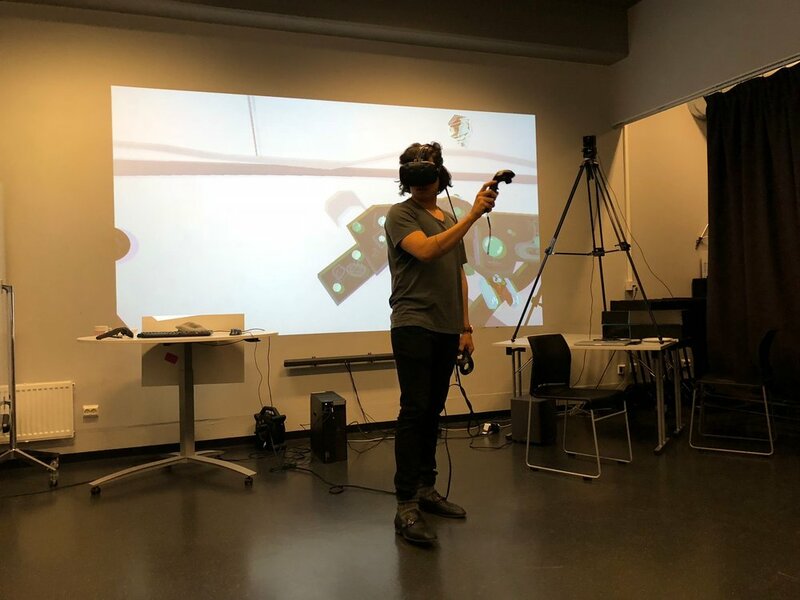 The workshop was led by Ali Zareiee and Tobias Andersen representing VR Oslo and they brought with them the AR Hololens, 360 camera equipment and even a brainwave scanning device that delighted workshop participants who were able to get a first-hand experience with the technology. Tvibit Filmveksthuset also showcased the use of AR in mobile phones with the most recent Star Wars game accessories. The other two workshops MuX (Workshop Leaders: Peter Connely and Eduardo Fouilloux) and Mindshow (workshop leader: Bjørn Gisvold) had smaller attendance with about 11 participants each and was well-executed and of huge interest to participants, generating new interest in creative development in the medium. Screenings of VR/360 film content was executed in 2 instances – firstly through a 5-day installation at Kulturhuset foyer with 5 x mobile VR headsets with curated film content from the Within media platform. The space was managed by TIFF volunteers with Filmvekshuset Tvibit providing ample training and installation of content material for use on the Samsung Gear headsets. A huge banner was printed out and mounted to brand the side program and helped generate interest and activity for SEEk. This area was open to members of the public from Tuesday 16th January to Saturday 20th January between 13,00 -16.00 and 17.00 to 21.00, but limited to users 13 years and up as according to manufacturer´s use recommendation. Visitors were given 15 minutes to use the VR devices freely and choose from a variety of 360 films material – from fictional film, documentaries, animations and music videos to watch from. This arrangement proved to be extremely popular and the location was a perfect space to give TIFF audiences a chance to sit down and for many, their first exposure of 360 film material. An estimated total of 270 visitors utilized the pop up VR cinema. A special screening session was also held at Fokus 6 on Saturday, 20th January where 360 film material was presented to cinema audience in an experimental format in which individual users were handpicked from the audience to put on the VR headset while the rest watch their mirrored experiences on the cinema screen. Films were handpicked to show some of the best, critically-acclaimed content such as The Evolution of Vrse, Kinoscope and Dear Angelica. The screening also presented two other 360 films, namely The Beta, produced and completed from 2017 NUFF workshop and Portals: An Extreme VR Experience, which included a presentation and QA from the filmmakers Adrian Ruiz Del Cerro and Patricia Valle. Permission was seeked from Oculus Story Studios and Within – which waived screening costs, or did not responded to enquiries about it. Mk2, the distribution partners based in France for the 360 film “Kinoscope” charged a minimal cost of €200 and this factored into the budget. Set up of this special SEEk screenings took place late Friday night, but it had to be packed down again while the short film programme was underway on Saturday morning. There was a very limited time window to get all the settings correctly calibrated, which caused a slight 10 minute delay to the start of the program. There was around 37 audience members in attendance and unfortunately, the screenings experienced a technical issue midway through which called for an uncomfortable reset in the middle of the program but resumed again quickly enough. Moreover, as an experimental method to showcasing VR/360 film content, the result was not entirely ideal for some of the audience and was highly dependent on having “viewers” who were trained to recognize visual cues and prompts. By the end of the screening, several audience members came up to request if they can view the films as intended through the VR headsets itself. Overall, SEEk was a very well-received and talked about event. It helps filmmakers and cultural actors to understand the legitimate value of the medium, and be an opportunity to showcase interesting content that has been represented in major international film festivals. The seminars and workshops too was an important opportunity for industry professionals and cultural actors based in North Norway to network and collaborate with guest visitors, building a conducive environment that can lead to future projects. The scope of the SEEk side-event was quite ambitious and challenging with a large variety of arrangements but it was successfully executed even with limited staffing and resources. The intention was to learn what works best for TIFF audiences through the variety of arrangements which is invaluable to creating a better, optimal version in the future. Based from feedback from audiences and TIFF staff, it has been suggested that SEEk will be better integrated with TIFF´s program with better handling and resource sharing opportunities for invited guests. Moreover, instead of spacing it out workshop arrangements during the course of the week and compete with so many other TIFF-related activities, a better practice might be to squeeze it into 2 days, making the program more impactful and easier to plan for. As an example, combining seminars with workshops would be a practical way for people already interested in the subject matter to have a proper hands-on experience right thereafter, making it interesting for viewers to test these experiences. In terms of screenings – the experimental method of showcasing VR/360 films through a traditional cinema screen is a novel concept – but it does not create an ideal user experience yet as screen orientation and steadiness of the viewer´s perspective makes for an uncomfortable viewing experience for the rest of the audience while set up requires more time in between regular screenings. Instead – it would be most interesting to find speakers than can talk and present their VR/360 films in the seminar, or to encourage audiences to experience it as intended on proper VR equipment. As such, it is also suggested that there is a perhaps a special one-day screening session for these bigger films, where purchasing a ticket would give you free access to roam around through several stations, perhaps in place at Kulturhuset Verkstedet to watch them. The challenge would be the need to setup more room-scale VR installations to showcase some of the bigger productions – most of which requires better hardware and PCs to play it than Samsung Gear VR headsets and to better handle pre-registration to avoid long queues. TIFF producers were very pleased with the results and are very interested to continue the co-operation for the years ahead. There is also discussions being held by filmmakers and industry professionals working within this niche to better co-ordinate and organize cultural festivals that are around VR and new media in Norway. It is intended that SEEk continues to keep itself updated on the latest movements in VR/AR – and to share these findings with media consumers in this region. There continues to be high focus in AR technologies and the upcoming release of the consumer version of the Magic Leap headsets, newer versions of room-scale VR headsets like the Vive Pro, Oculus Go and other new market contenders can only produce better visual fidelity for better quality immersion. As more well-known directors work on experimenting with the medium – this will continue to generate high interest to see these works. SEEk looks forward with representing this interest and community in North Norway and to collaborations in the years ahead.